Heat 1 tsp oil in a pan or kadhai and roast all the above mentioned ingredients for few mins. Remove from the heat and allow to cool. Grind in a mixer adding little water to smooth paste. Pressure cook channa with 1 cup water for 2-3 whistles. Remove from the heat and keep aside. Pressure cook toor dal and garlic flakes with 1 cup water for 2 whistles. 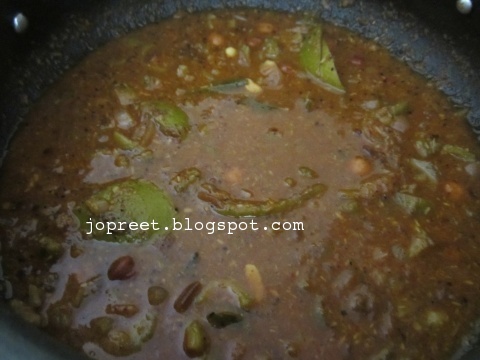 Allow to cool and mash the dal. Heat 2 tbsp oil in a pan or kadai. Tamper mustard seeds. Add vadagam and curry leaves. Saute a while. 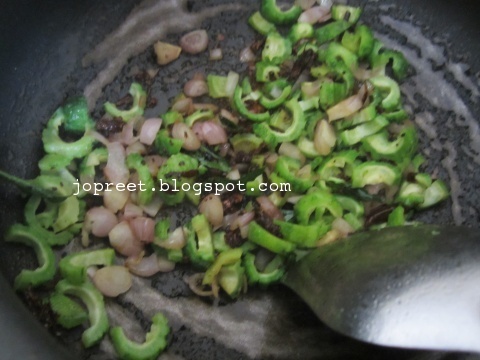 Add chopped onion and fry for few mins. 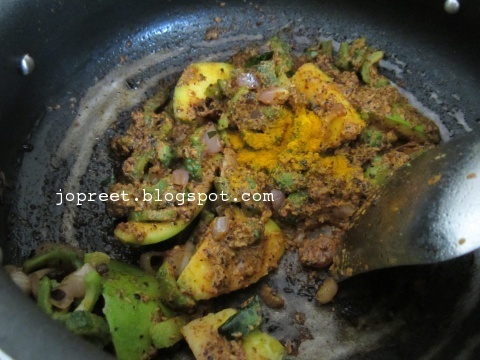 Add chopped karela, cooked channa and mango cubes. Saute a while. Add cooked dal, turmeric powder and grounded paste. Mix well. Add red chili powder and 2 cup water. Add salt to taste and cook it covered till the curry thickens. Garnish with chopped coriander and serve hot with rice. Looks good, I like the idea of replacing tamarind with mango.. This looks so delicious and inviting, PT!! Nice combo Preethi! mango and bitter gourd!! very tempting even while writing the comment!! nice idea of using mango pieces instead of tamarind…delectable clicks..
Paavakkai ang managing? Hmm.,.nice combo! Looks yummy! Very nice dear, you have replace the tamarind with mango gr8 idea. Beautiful pics. 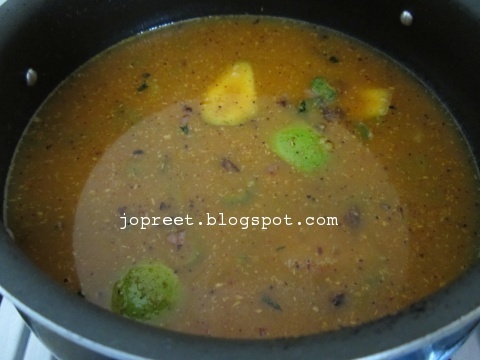 Delicious bitter gourd pitlai, love the addition of mango. Pitlai with pavakka and manga, omg can imagine the flavour of this dish..Well done sis.. Loved the combo! I'm sure it would have tasted great!! wanted to try this long time 🙂 some how missed it ! good one on healthy aspect ! love pavakka ….i will try this one.